Lies on the south bank of the Yangtze River, Nanjing, the capital of Jiangsu Province, is one of the most delightful of Chinese cities. Known as the Capital City of Six or Ten Dynasties in China’s history, it has a brilliant cultural heritage. Yuecheng, the first recorded military defense constructed in early 472 B.C., opened the long history of Nanjing. In the following years, the city reached its height of splendor at various times. In 229, Sun Quan, one of the three heroes in China’s Three Kingdoms Period (220 - 280), to strengthen his influence in the middle valley of the Yangtze River, moved the capital of his kingdom to Jianye - present Nanjing. From that time on, the city served as the capital for several dynasties in China’s history. In 1356, in a peasant rebellion, Zhu Yuanzhang, later the Emperor Taizu of the Ming Dynasty (1368 - 1644), conquered the city and renamed it Yingtian Fu. In 1368, Zhu established the Ming Dynasty - the last feudal dynasty ruled by the native Han people - and gave Yingtian Fu the new name of Nanjing. Ten years later, the emperor made Nanjing the capital of the country. The mausoleum of Emperor Zhu Yuanzhang is perching on the southern slope of the Mount Zijinshan in the northeastern part of the city. Following officials’ advice of "building walls and producing grain to consolidate the rule", the emperor ordered the construction of city walls. Today’s majestic walls in Nanjing, the longest of its kind in the world, are the result of that phase of construction. Zhonghua Gate, simply meaning ’Chinese Gate’, is a noted attraction for tourists in the present city center. In spite of its glorious times, the city also witnessed the hardest moment of this nation. In 1839, the Opium War burst out after Lin Zexu, an assiduous official, burnt twenty thousand boxes of opium in Humen. On a battleship in Nanjing’s Xiaguan, the corrupt Qing government, under threat by Britain troops, signed the notorious Nanjing Treaty, the first of the ’Unequal Treaties’ which ceded Hong Kong away from China for more than hundred years. Following this treaty, invasions and colonial rule of the western countries intensified and China sank into a harder and darker time. Peasant groups of Taiping rebelled against the Qing government in 1853 and established the Taiping Heavenly Kingdom in Jinling, Nanjing’s name at that time, and formed an army. Unfortunately, the peasant regime was short-lived and in 1864, troops of Qing government won the city back. Nowadays, in Xuyuan Garden , one can still see part of the palace of Heavenly King of Taiping Heavenly Kingdom. It was the Revolution of 1911, the Chinese bourgeois democratic revolution led by Dr.Sun Yat-Sen that overthrew the Qing Dynasty. On the first day of 1912, Dr. Sun Yet-sen gave his simple but sublime address on the inauguration held of the new Republic of China. Today, a memorial hall in the Mausoleum of Dr. Sun Yat-Sen, houses a statue of Dr. Sun sculpted out of white marble. There are two further negative memories of the city. On April 18th, 1927, Chiang Kaishek launched the counter-revolutionary 4.12 Coup and established his power in Nanjing. Also, in 1937, the inhuman Nanjing Massacre happened. In six weeks, more than 300,000 Chinese people were killed including women and children. No atrocity can go unpunished. After eight years of resistance, in 1945 the brave Chinese people eventually drove the barbarous Japanese invaders out of China’s homeland and the war criminals got what they deserved. However Chinese people will never forget the history. Pictures of the atrocities of Japanese soldiers taken by Japanese army photographers are exhibited in the Memorial Hall to the Victims in the Nanjing Massacre. Finally, on April 23rd, 1949, Nanjing was liberated by the People’s Liberation Army and Kuomintang’s power in China was ended. In addition to historical sights, memorials, museums and cultural sights also attract thousands of travelers. The famous Confucius Temple (Fuzimiao) is not only a memorial place for the Great Sage in China but has a surrounding area bustling with shops, restaurants and a snack street housed in traditional Chinese architectural buildings. In the city center, Nanjing Museum is a must for travelers with a collection of more than 420 thousand pieces, including about 2,000 that are rare and valued. The observatory on Zijinshan Mountain to the east of the city center was the first modern observatory built in China. Qin Huai River , in the southwest of the city, extends one hundred kilometers. 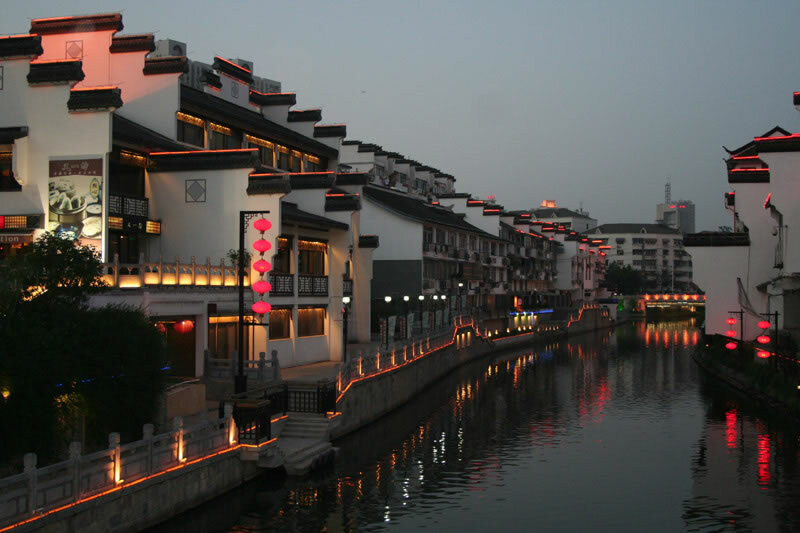 The river used to be the most flourishing part of Nanjing in the old days. In many Chinese novels, it is renowned as a place which nurtured beauties and romance. Today, it is a place for people to recall the old splendor of this historical city. Like all sights in Nanjing, it tells the story of past, present and future of the city. Like most major cities in China, Nanjing is developing rapidly. Great changes have taken place in the city. Modern highways and railways connect the city with most major cities throughout the country and it is becoming a sparkling metropolis akin to Shanghai and Beijing with skyscrapers, luxury hotels, fashion shopping malls, supermarkets and highly-developed economic zones throughout the city. Transport in the city is very convenient with the new metro service in addition to taxis, public buses, tourist special lines and other means of transport. Modern amenities in luxury hotels make your trip a comfortable one. Dazzling shopping malls and department stores can be found in the commercial areas of the city with stocked plenty of international brand names. Nanjing is also home to several colleges and universities and a large foreign population. The city is become an international metropolis with new faces every day.